If you’re someone with a keen interest in fashion and enjoys the finer things in life, you’ve probably heard of one the most luxurious and rare materials in the world – vicuña. If that’s the case, you’re also likely to know that the cost of a coat made of vicuña starts at around $20,000. This is a price tag that’s sure to put off many people from purchasing an item like this. But in this blog we take a closer look at the incredible qualities of the vicuña and why paying so much for a vicuña garment might just be one of the best investments you ever make for your wardrobe. The vicuña is an animal that’s closely related to the llama but it’s smaller and more graceful. It lives in South America and primarily in the high alpine plateaus of the Central Andes mountain range. Countries where you can find it include Peru, northwestern Argentina, Bolivia, northern Chile, and central Ecuador. The length of the head and body of a vicuña typically ranges from 1.45 to 1.60 meters (about 5 feet); and shoulder height is from 75 to 85 cm (around 3 feet); its weight is from 35 to 65 kg (under 150 lb). In ancient times, vicuña clothing was only made for the most elite people in society. This included Inca royalty in Peru. The Incas believed that the doe-eyed vicuña with its fine fleece was a representation of a woman whose hair was made of fine strands of gold. Following the arrival of the Spanish conquistadors in South America, the animals were hunted rather than sheared. Over the centuries, this led to a rapid decline in vicuña numbers. By the late 1960s, this precious animal had been hunted almost to distinction, with less than 5,000 left in the Andes. After many unsuccessful attempts, the Peru government finally agreed to ban the hunting of the vicuña. In addition, nature reserves were established to preserve the animals and increase their numbers. Today, there are an estimated 125,000 vicuñas, which means they are still listed as threatened. The hairs of the vicuña are the finest of any animal in the world, and are extremely soft and super light. Even compared to the finest cashmere the cloth produced from these hairs feels much more luxurious. In addition, and unlike sheep’s wool and other materials, the vicuña does not produce lanolin, which also means its hairs are hypoallergenic. And if that wasn’t enough, vicuña fibers are hollow and interlock in a way that holds warmth in without extra weight. This means the animal can tolerate the freezing climate of the Andes, and any garments made from its coat are fantastic at keeping its wearer warm, even in sub-zero temperatures. Compared to other animals, vicuña fleece is produced much more slowly. Typically, an adult vicuña only produces nine ounces of raw fiber every year, of which only five ounces can be used in the creation of clothing. Couple this with the fact that there are a small number of vicuñas in the world and you can begin to understand why vicuña material is so rare and expensive. 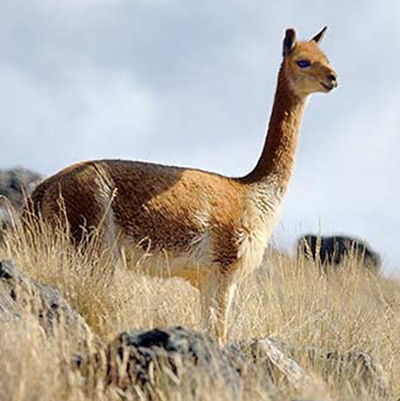 Latest figures show that between 13,000 to 17,500 pounds of vicuña wool is available every year to Loro Piana, the biggest supplier of vicuña in the world. This compares to 22 million pounds of cashmere. On top of this, the vicuña is not commercially farmed. Its fibers are collected using the traditional ‘chakku’ method of the Incas, a half-religious ceremony that involves a local community forming a chain around the animals and then closing in on them so they can be sheared. It’s for all these reasons that the current price for vicuña is $399 to $600 per kilo, compared to $75 to $85 for cashmere and $5 to $6 for wool. Or alternatively, you will have pay around $2,500 for a yard of vicuña cloth. This equates to an off-the-peg sports coat costing upwards of $20,000, and a made-to-measure suit starting at $40,000. There is no doubting that vicuña is the best of the best. It’s why icons like Nat King Cole, Greta Garbo and Marlene Dietrich were all vicuña devotees in their heydays, and why so many A-listers today want to get their hands on vicuña garments. At HKT, we’re also massive fans of this incredible cloth. Once you feel it in your fingers you will understand why it was originally reserved for royalty. This is one of the finest and most exclusive cloths on the planet and we feel very privileged to have access to it. But the big question is: is a $20,000 vicuña coat worth it? Our answer is an emphatic “Yes!”. This is an investment you’ll never regret. So if you are looking for something truly special for your wardrobe, please get in touch with us about the off-the-peg and bespoke vicuña clothing we can offer you. Alternatively, if vicuña is too pricey – and we totally understand why it might be – please remember that HKT can create for you incredible made-to-measure garments in other exquisite cloths that will fit you perfectly and make you feel like a million dollars. Simply call us on 770-458-8682, or email service@hktclothiers.com, to book your free style consultation.